Can someone explain to me where the thriller part was? At least I’ve found the fast-forward button on my remote control now. Put five people in a closed room with the following task : who leaves that room alive gets a decent job offer. And after that you can see how creative a person can be with a belt, a stilettoheel or a piece of a mobile phone. This was an incredible empty and dismal movie. The acting was so tragically bad you could start crying. Even the crying part of Willig was so pitiful. The rest of the candidates were third-rate actors to me. Very bad performances. Worst of all, the fact that McDowell joined this made me speachless. From “A Clockwork Orange” to this monstrosity … how low can you fall. Probably a new trend in movie land: put a known actor on the DVD box so that there is a minority who’ll do the effort to watch it. I also fell for this marketing trick. 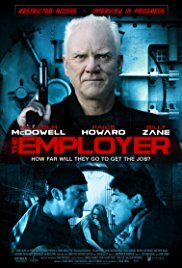 Something I have learned from this film: I’ll be very suspicious when I’m applying for another job. I give this one a 1/10 just for myself because I did the effort to push the “Play” button !